A total of 16 of the finest players from around the world will be competing in the event, which will be staged over three days during the annual BCAPL National 8 Ball Championships. 2009 PartyPoker.net World Pool Masters Back at the Riv! FOLLOWING on from the success of the 2008 event, the PartyPoker.net World Pool Masters will be returning to the historic Riviera Hotel and Casino as pool’s most prestigious invitational event gets underway from 8th to 10th May. Promoted by Matchroom Sport, a world leader in televised pool, the PartyPoker.net World Pool Masters will be running for the 17th year consecutive year and its roll call of champions reads like an international who’s who of 9 ball. Defending champion Alex Pagulayan of the Philippines will be back at the Riviera as will runner-up Mika Immonen (Finland), the reigning US Open champ. Other players confirmed include World 10 Ball Champion, England’s Darren Appleton; Mosconi Cup star Tony Drago (Malta) and former World No.1 Dennis Orcollo of the Philippines. Representing United States hopes will be the top two American ranked players on the BCA Men’s Point List, Shane Van Boening and Johnny Archer. Montreal’s Dancing Bear, Alain Martel, will be flying the flag for Canada. The European vanguard of five-times Masters champion Ralf Souquet (Germany) and Holland’s multi-titled Niels Feijen will both be in attendance. They will be joined by top ranked European stars Nick van den Berg of Holland, England’s Imran Majid, who KO’d Van Boening in this event last year, and teenage Russian sensation Ruslan Chinakhov who will be making his Masters debut. Challenge of Champions winner and ’07 World Cup winner Fu Jianbo will be making the trip from China and 2005 World Pool Masters victor Raj Hundal, now representing India, will return to the fray at the Riviera. There is one female in the 2009 Masters line-up and that honour this year goes to the rising star of the women’s game, 21 year-old Korean Yu Ram Cha. Once again, the Masters will be promoted in partnership with Mark Griffin’s BCA Pool Leagues and the opening first round matches take place on the evening of Friday, May 8, culminating in the championship match on Sunday, May 10. Matchroom Sport Chairman Barry Hearn said: “The event was a big success for us last year at the Riviera and we’re looking to build on that in May. “The crowds at the Masters were good and with the outstanding line-up we have assembled this year, I am sure that we will have bumper crowds. ‘Speak to any of the players; this is the event they all want to win and looking at the field, anyone of them can emerge triumphant,’ he added. As always, the World Pool Masters will be televised throughout the world in 15 one-hour highlights programmes. There will be a $66,000 prize fund, an increase of 6.5% on last year, with the winner collecting $20,000. 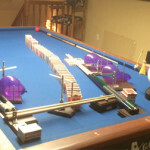 BCAPL’s Mark Griffin added: ‘BCA Pool League players love professional action. They are excited the World Pool Masters will return to the Riviera for 2009, and they hope that Matchroom will continue to honor our tournament with their participation for years to come. ‘The finest amateur and professional players from around the globe gather every year at the Riviera for “The Greatest Pool Tournament in the World,” and the tradition continues,’ he added.